The Cost of Living explores the subtle erasure of women’s names, spaces, and stories in the modern everyday. In this “living autobiography” infused with warmth and humor, Deborah Levy critiques the roles that society assigns to us, and reflects on the politics of breaking with the usual gendered rituals. What does it cost a woman to unsettle old boundaries and collapse the social hierarchies that make her a minor character in a world not arranged to her advantage? Levy draws on her own experience of attempting to live with pleasure, value, and meaning--the making of a new kind of family home, the challenges of her mother’s death--and those of women she meets in everyday life, from a young female traveler reading in a bar who suppresses her own words while she deflects an older man’s advances, to a particularly brilliant student, to a kindly and ruthless octogenarian bookseller who offers the author a place to write at a difficult time in her life. The Cost of Living is urgent, essential reading, a crystalline manifesto for turbulent times. "Searching for something to read after devouring Women and Power? 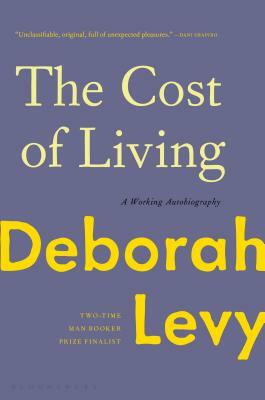 Known for her piquant novels, Deborah Levy now takes to non-fiction, with a 'working autobiography' that comprises thoughtful dissections of life as a woman." - Elle Magazine, "Here Are the 21 Books We're Most Excited to Read in 2018"